تاجیک, زینب, کیوانی, یزدان. (1397). مقایسه تفاوت‌های شکلی جمعیت‌های ماهی کولی ارومیه (Alburnus atropatenae). فصلنامه محیط زیست جانوری, 10(2), 149-160. زینب تاجیک; یزدان کیوانی. "مقایسه تفاوت‌های شکلی جمعیت‌های ماهی کولی ارومیه (Alburnus atropatenae)". 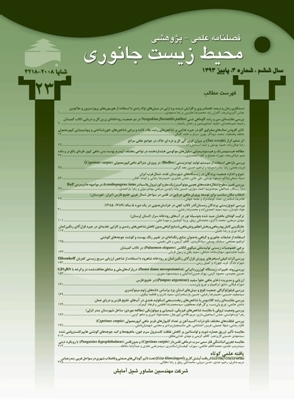 فصلنامه محیط زیست جانوری, 10, 2, 1397, 149-160. تاجیک, زینب, کیوانی, یزدان. (1397). 'مقایسه تفاوت‌های شکلی جمعیت‌های ماهی کولی ارومیه (Alburnus atropatenae)', فصلنامه محیط زیست جانوری, 10(2), pp. 149-160. تاجیک, زینب, کیوانی, یزدان. مقایسه تفاوت‌های شکلی جمعیت‌های ماهی کولی ارومیه (Alburnus atropatenae). فصلنامه محیط زیست جانوری, 1397; 10(2): 149-160. ماهی کولی ارومیه (Alburnus atropatenae) بوم­زاد رودخانه‌های حوضه دریاچه ارومیه است. در این مطالعه تعداد 274 قطعه ماهی کولی ارومیه از هفت رودخانه آق‌دره، نازلوچای، باراندوز، ساروق، زرینه‌رود، سنته و تلخه‌رود مورد بررسی قرار گرفت. در بررسی ریخت‌سنجی هندسی در موقعیت لندمارک‌های شماره 2، 3، 8، 7 و 9 بیش ترین تغییرات مشاهده شد. هم­ چنین در تحلیل متغیرهای کانونی (CVA) جمعیت تلخه‌رود تا حدودی از سایر جمعیت‌ها و جمعیت نازلوچای به ­طور کامل از جمعیت سنته و زرینه‌رود جدا شد. نتایج آنالیز معنی‌داری تفاوت‌های شکلی نشان داد بین جمعیت‌های باراندوز و تلخه‌رود، باراندوز و نازلوچای، و زرینه‌رود و سنته تفاوت معنی‌داری وجود ندارد (0/0001<P)، که از بین این جمعیت‌ها، دو جمعیت زرینه‌رود و سنته بیش ­ترین هم‌پوشانی را نشان دادند. تفاوت معنی‌داری بین دو جمعیت آق‌دره و تلخه‌رود، و تلخه‌رود و زرینه‌رود بود و کاملاً از هم جدا نشان داده شدند (0/0001>P). بیش ­ترین تفاوت‌ها و جابجایی‌ها در بین دو جمعیت آق‌دره و تلخه‌رود مشاهده شد. روش ریخت‌سنجی هندسی با وجود دارا بودن اختلاف معنی‌داری بین هفت جمعیت تنها توانست ماهیان جمعیت تلخه‌رود را از سایر جمعیت‌ها تا حدودی جدا کند. Banimasani, M.; Keivany, Y. and Ebrahimi, E., 2017. Comparative geometric morphometric study of Capoeta fusca populations. J. Env. Anim. Biol. : In press. Bookstein, F.L., 1997. Landmark methods for forms without landmarks: localizing group differences in outline shape. In: Workshop on Mathematical Methods in Biomedical Image Analysis. (eds. Rohlf, F.J and Bookstein, F.L.). Vol. 1, pp: 225-243. Coad, B.W., 2017. Freshwater Fishes of Iran. www.briancoad.com. Doherty, D. and McCarthy, T.K., 2004. Morphometric and meristic charateristics analysis of two westwrn Irish populations of Asctic Char, Salvelinus alpinus, Biology and Enviroment. Proc.Roy. Iri. Acad. Vol. 104, pp: 75-85. Eagderi, S.; Esmaeilzadegan, E. and Maddah, A., 2013. Body shape variation in riffle minnows (Alburnoides eichwaldii De Filippii, 1863) populations of Caspian Sea basin. Taxon. Biosyst. Vol. 5, No. 14, pp: 1-8. Jonning, S.; Reynolds, J.D. and Mills, S.C., 2002. Life history correlates of response to fisheries expoitation. Fish. Proc. Roy. Soc. Lond. Vol. 265, pp: 333-339. Keivany, Y., 2008. A summary of phylogenetic fish systematics. Isfahan University of Technology Press. 220 p.
Keivany, Y.; Nasri, M.; Abbasi, K. and Abdoli, A., 2016. Atlas of inland water fishes of Iran. Iran Department of Environment Press. 218 p.
Mitteroecker, P. and Bookstein, F.L., 2007. The conceptual and statistical relationship between modularity and morphological integration. Syst. Biol. Vol. 56, pp: 818-836. Mouludi-Saleh, A.; Keivany, Y. and Jalali, S.A.H., 2017. Geometric Morphometric Comparison of Namak Chub (Squalius namak, Khaefi et al., 2016) in Rivers of Lake Namak Basin of Iran. Res. Zool. Vol. 7, No. 1, pp: 1-6. Pakkasmaa, S. and Piironen, J., 2001. Water velocity shapes juvenile salmonids. Evol. Ecol. Vol. 14, pp: 721-730. Poulet, N.; Berrebi, P.; Crivelli, A.J. ; Lek, S. and Argillier, C., 2004. Genetic and morphometric variation in the pikeperch Sander lucioperca of a fragmented delta. Arch. Hydrobiol. Vol. 159, pp: 531-554. Turan, C., 1999. A note on the examination of morphometric differentiation among fish populations: The truss system. Turk. J. Zool. Vol. 23, pp: 259-263.